To help make it easier to navigate our website, we have added a new "search bar" feature. This new feature enables site users to find information and documents on the LCMC website by typing in what they're looking for, as opposed to using the menu at the side of our homepage. For those who may be new to using the internet, or have limited computer skills, a brief tutorial on how to use this feature to find information on the LCMC website is included below. Locate the search bar. 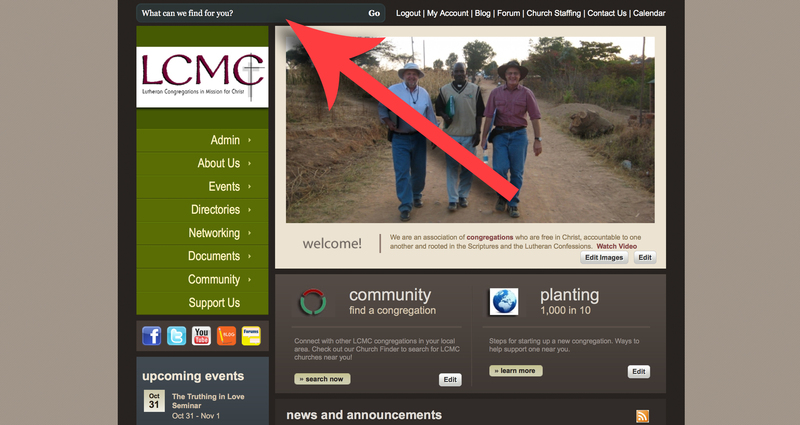 It will appear as a blueish box in the upper left hand corner of our website, just above the LCMC logo. Type in what you're looking for. Once you've located it, click on the search bar. Then, type in the subject, keywords, location, person's name or congregation that you are searching for. You can link words or phrases together with the "+" sign to narrow your search. In many instances, a dropdown menu may appear beneath the search bar when you begin typing. Instead of clicking "Go" (Step 3), you can also click on items in the dropdown menu. Click "Go". If you haven't found what you are looking for in the dropdown menu described above, finish typing and then click "Go". Get results. You will be redirected to a new page, which will include a list of links to pages that contain information related to your search. If no results are listed, first check to make sure that the words you typed in were spelled correctly, as misspelled words and typos can affect your search results. If your spelling is correct, but you did not receive any results, try a new search using different words. You may get different results by using synonyms for the keywords that you have chosen, or by phrasing things differently. Try a broader search. If the topic your are searching for is too specific, sometimes searching for a more general topic can help. For example, if you tried searching for "Michigan Pastors" and no results showed up, you could then try only typing in "Michigan". Try a more specific search. If the list of search results that you received is very long, or seems to be unrelated to what you're searching for, you can try adding additional keywords to your search to make it more specific.